Join Brian every other Tuesday as he talks comic books from a reader’s perspective, both his new experiences with the medium and reflections on over thirty years of enjoying the finest in sequential art. For someone who’s been reading comics, specifically Marvel comics, for over thirty years (like I have), that Asimov quote very accurately describes the experience of going back and reading comics from Marvel’s early days in the 1960s. The first few years of titles like The Amazing Spider-Man, The Fantastic Four, and The X-Men are something similar to the storytelling to which I’ve grown accustomed, but the differences definitely comprise an uncanny valley, and that can make the reading experience strange, to say the least. So what is it like to read these books? Not easy, for me at least. Even in the first comic books I read in the late ’70s and early ’80s, there was a certain verisimilitude to the dialogue and behavior I saw in those pages. Sure, they were flamboyantly costumed superhumans leading action-packed lives and given to grandiose speechifying, but in general what I was reading, even at its most outrageous, was penetrable to my young mind. I could easily bridge the gap between the real world and these imaginary goings-on, because I could recognize and understand the behaviors and reactions of the characters. In other words, I could get there from here. As both I and the comic book medium have matured, writers like Alan Moore, Warren Ellis and Brian Bendis have only increased that verisimilitude and psychological credibility. That was definitely not the case in the first few years of Marvel Comics’ existence. Even allowing for differences in slang and social protocols between the early 1960s and today, the dialogue is extraordinarily expository and broad. In many panels, especially during action sequences, characters are shouting what they’re doing and/or seeing at each other, or engaging in very on-the-nose “As you know, Bob” infodumping. There’s little to no experience in these stories of images speaking for themselves, and very little sense of the characters having conversations or talking to each other, y’know, the way people do. In many cases the writer visibly wields a heavy blunt instrument, storytelling-wise. 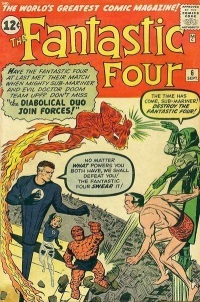 The “realistic” character conflicts, for which Marvel was so highly praised, were often forced; for example, the Fantastic Four’s Thing and the X-Men’s Iceman were both unrealistic hotheads who flew off the handle at the least provocation and—also unrealistically—failed for years to learn or modify their behavior despite repeatedly rushing into situations, and thereby invariably causing their teammates danger and difficulties. I’ve had to wonder why that was the way it was. At first, I went with the simplest explanation I could think of: Stan Lee (who was writing just about everything at Marvel in those early years) just sucked. But while I disagreed with this insulting but impassioned defense of Stan the Man, it did get me thinking of alternative explanations, especially as I read more of Marvel’s formative years. Part of it has to be the storytelling environment of comic books, specifically Marvel Comics, in the 1960s. When the “Marvel” brand was born in 1960 and ’61, it was just one arm of publisher Martin Goodman’s “Magazine Management” pulp magazine empire. That empire had owned comic book imprints going back into the 1930s, first with Timely Comics (where Captain America and the Sub-Mariner were born) and later, in the ’50s, with Atlas Comics’ roster of romance, Western, war, adventure, and fantasy anthology comics. Superheroes were well-established, having prospered for decades for companies like Fawcett, Charlton, and of course National/DC. But they hadn’t yet formed the larger-than-life, cross-pollinated soap-opera tradition that would become standard later in the ’60s and ’70s. So Lee and his compatriots, all of whom had been making comics for Goodman’s companies since the ’40s, might have believed in the innovativeness and potential of comic mags like The Fantastic Four, but in practice they were just one more pulp entertainment product—cheap, disposable escapism that had to be churned out on a tight schedule. That seems, to me, like one reasonable explanation for the broadness and exceptional, well, pulpiness of Lee’s dialogue in those days. Another likely explanation was the sheer workload. 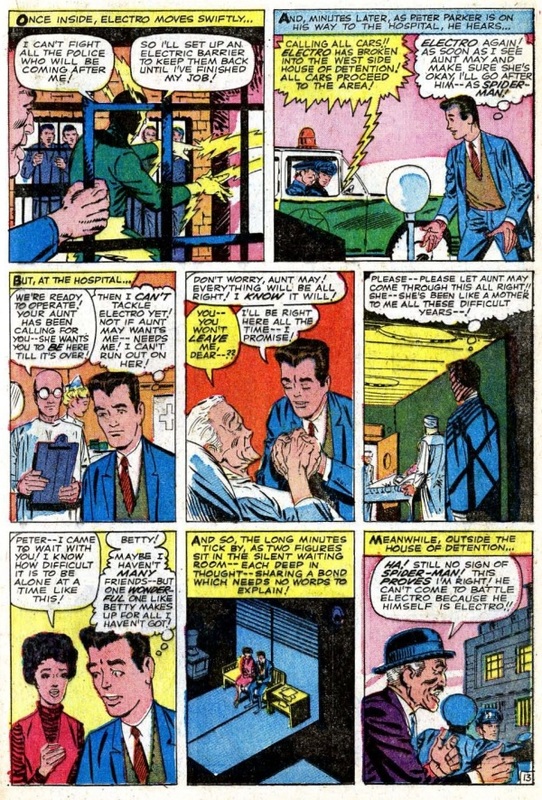 Even though those early Marvel superhero titles started out bi-monthly, Lee and his artists—Steve Ditko on Amazing Spider-Man and the Doctor Strange portion of Strange Tales, Don Heck on the Iron Man part of Tales of Suspense, and Jack Kirby on just about everything else—still had to turn out a ridiculous amount of content on a regular basis. That workload had to be grueling, especially for Lee, who seems to have just written and written and written until the mid-’60s, when folks like Roy Thomas, Gary Friedrich, Gerry Conway and Stan’s own brother Larry Lieber came on board to share the writing duties. I definitely think that’s part of the reason the plotting and dialogue seem so clunky. But over the last few nights, as I read the first two years of The Amazing Spider-Man by Lee and Ditko, I noticed something. You see, due to the need to produce so much work so quickly, Lee and his artists quickly developed a new way of working that soon became known as the “Marvel Method“—the writer would initially create only a rough plot outline which would then be fleshed out by the artist as they laid out and pencilled the pages, with the dialogue added only after the rough art was finished. Therefore, the artist definitely had a certain amount of influence on the writing and the storytelling. What I noticed, in light of that knowledge, is that while the many Lee/Kirby books suffered from the character and dialogue problems I described above, The Amazing Spider-Man didn’t, or at least did so to such a lesser degree that it’s very noticeable. The only conclusion I can draw from this is that it’s the artist’s contribution to the story that’s the problem. It was Kirby who had trouble with psychological verisimilitude, and Ditko who was just plain better at depicting people in a believable light. Lee merely became the hard-working channel through which those differing storytelling abilities were formatted and packaged for public consumption. Don’t get me wrong. That these men achieved the startling level of quality that they did under such circumstances is worthy of praise and respect. And I have nothing but the deepest reverence for “King” Kirby’s groundbreaking influence on all comic art, for the dynamism and stunning dramatic potential he innovated in the medium. 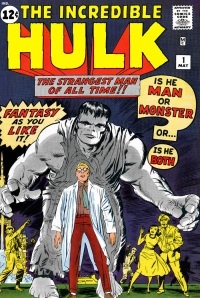 I’m just wondering if it’s specifically his contributions to the Marvel creative process that are responsible for that “uncanny valley” I’m experiencing in reading these old comics. What do you think, true believers? Am I onto something here, or am I barking up a completely stupid tree? Just came across this. I find it insightful and I think rather close to the mark. It’s easy for Ditko to get overshadowed by the amazing Kirby. Your points are especially apt for the beginning of each series. I do think Stan’s writing, however, improved very quickly, and reduced this uncanny valley. From the start, Spider-Man was by far the most relatable. That was it’s revolution. Spider Man came straight from Lee’s heart–I imagine the character flowed out of him far easier than say, a Prof X or Iron Man. Also, I think you’ll find that FF quickly developed into a book with a much narrower “valley.” By the introduction of the Silver Surfer, I find it much closer to the modern era–more information in the art, faster paced, etc. I think you’re right on about a sort of seismic shift in comic writing. I would argue that it advanced further in some areas quicker than others. 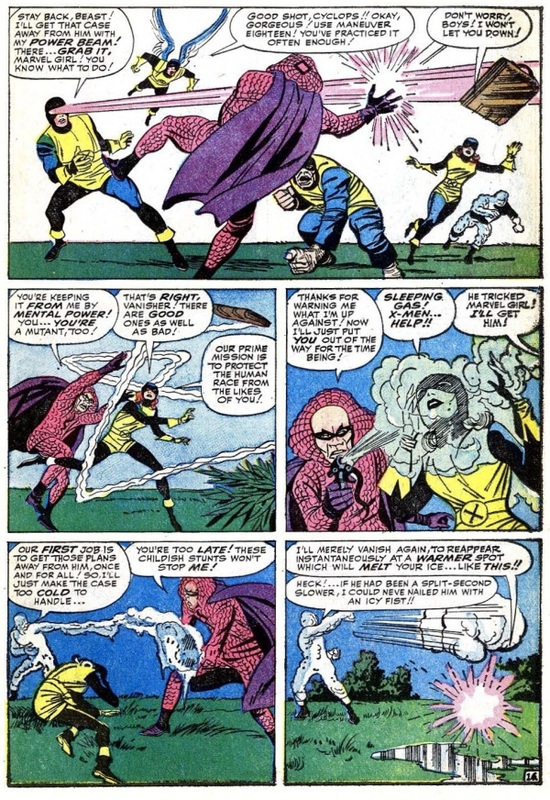 Avengers remained rather “old style” up through the Kree-Skrull War (one of my favorite examples of the early style, though it was somewhat of a dinosaur by then (early 70s) — the cosmic creativity disguised its old fashioned flow. For me, the big move away from the over-exposition, at least in my limited-to-marvel experience, occurred with Frank Miller’s Daredevil. Even the great books of the mid 70s,, Claremont, Starlin, etc., had a good touch of that over expository older style. By the way, be sure to read those old Silver Surfers, Lee and Buscema, in my opinion Stan’s best work (not as perfectly consistent and delightful as his Spiderman, but far more ambitious).